It’s Silhouette Creators Challenge time again! This month we are all about the backyard. With summer in full force around here, we are definitely spending a lot of time in our backyard. I have been busy making all kinds of things already too, like an outdoor sofa, kids patio chairs, a treasure chest toy box, and now we are working on a DIY playhouse! Whoo, lots to do for the backyard. 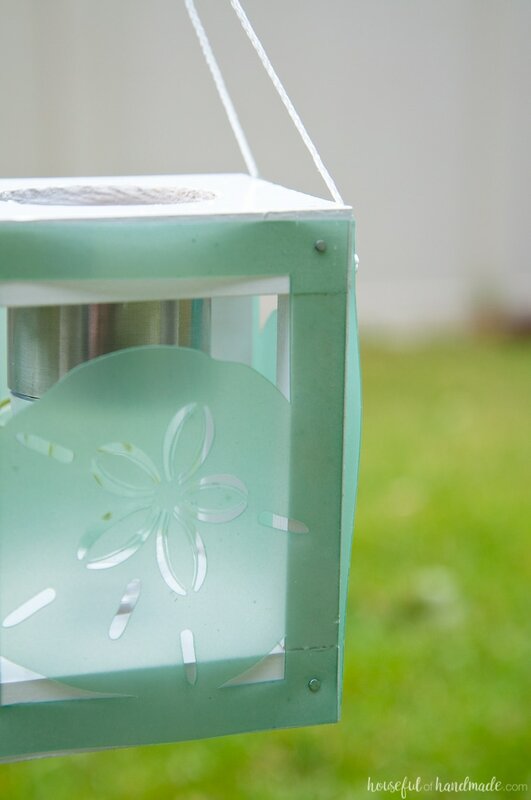 But this week I decided to make things pretty with this Coastal Solar Lantern Decor, and it definitely makes things prettier. As soon as the weather starts to warm up, we love spending so much time outside. The kids have been cooling off in our super fancy blow-up pool (I am pretty sure jumping into ice cold water from the tap is what toughens kids up). We have been gardening, and trying to keep our new found gopher from eating all our hard work. And we have even been relaxing and roasting mallows in the evening. We are taking full advantage of all things backyard. So when Cat from Pocket of Posies told us this month’s challenge was for the backyard, I knew I wanted to make something beautiful. I have a lot of function right now, but not much outdoor decor. 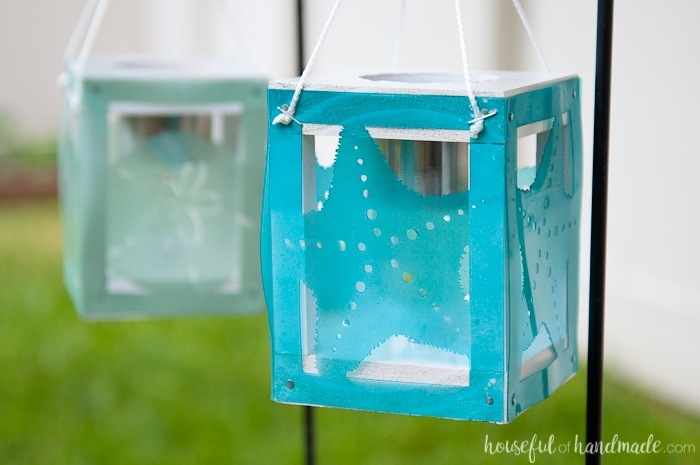 And since I am going for a coastal theme (okay, I bought some oar pillows last year and that is where I want the decor to go), I decided make some coastal solar lantern decor with my Silhouette! 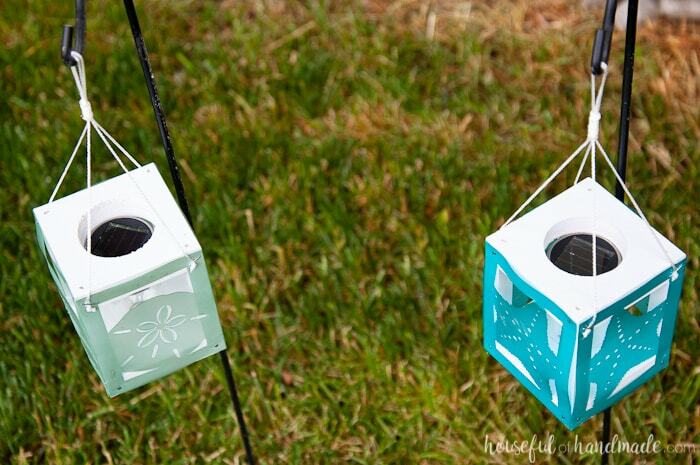 First thing I needed to do was figure out how to make my DIY decorative lanterns light up. As pretty as they are in the day time when the sun is shining, I wanted them to be even more beautiful as the hubby and I are sitting outside enjoying a glass of wine after the kids are in bed. A little ambiance lighting maybe?? So I went to Target and found these $2 solar lanterns. I didn’t need the stake that mounts them in the garden. But the lighted easily popped off the stake part. Perfection! Then all I had to do was build a simple box and add some decorative sides! I decided to use some thin plastic sheets so they would hold up to the weather. I bought these clear plastic sheets to make wall stencils (see them here & here), but I have a bunch more left over. I designed the sides to have a beachy theme. And what’s more beachy than sand dollars and starfish?! These are some of my favorite sea creatures. So beautiful! And then I added a little more coastal love with left-over sea glass spray paint. 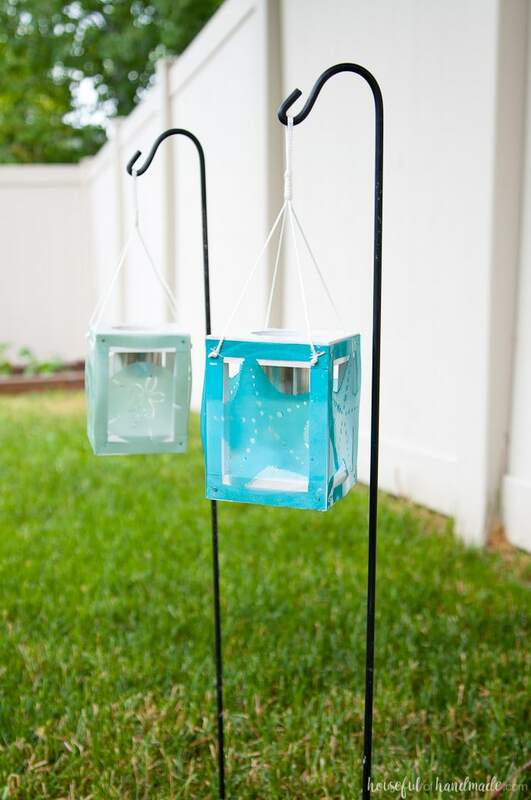 You can hang the lantern on hooks or set them on the table. I don’t have an outdoor table yet, but I have these hanging hooks from some Halloween decorations I bought years ago. 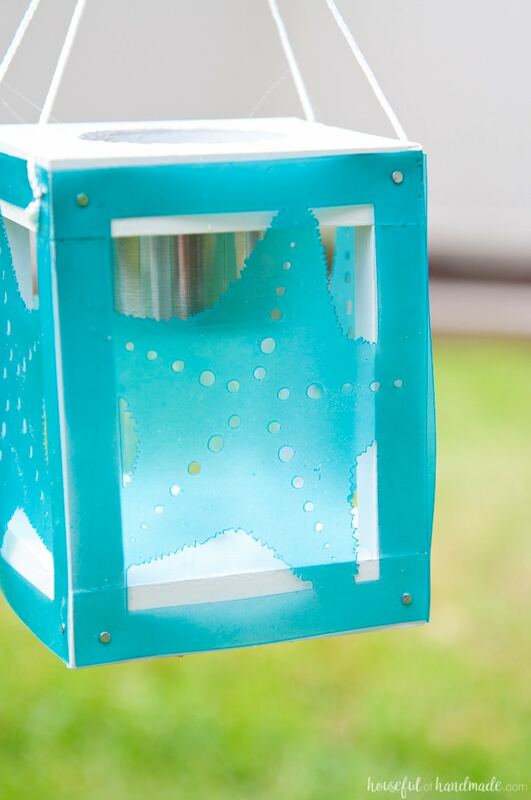 So if you are ready to make your own coastal solar lantern decor, click the arrow below for the full tutorial. 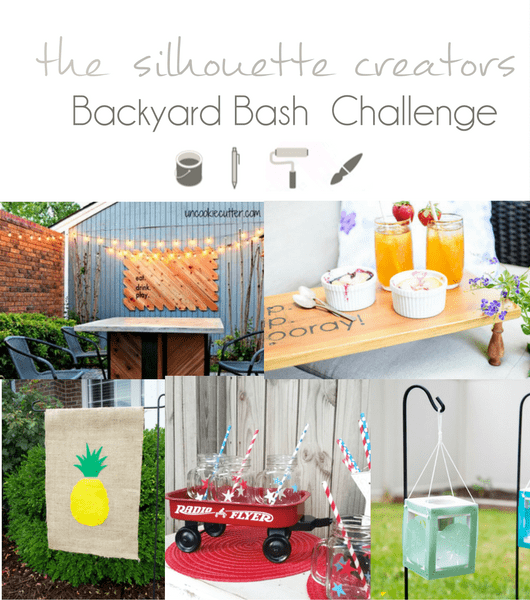 And don’t forget to check out the rest of the these fantastic projects for the backyard with your Silhouette machine! I don’t own a Sillouette, but do have a Cricut. Can you save the cuts on the plastic as svg or pdf file? Thank you. Thanks for letting me know I didnt include the SVG, I just started doing that. I have added it to the library for you now! Was it a programmable one like Cricut? I used my Silhouette Cameo (yes it is similar to the Cricut) to cut them out. What I meant there is to send the file from your computer to the machine a second time before unloading it. That way it cuts in the exact same spot. If you unload then reload the cutting mat, it may be off when you cut the material a second time. Solar lights are so wonderful and yours are terrific. I love the colors too! Thank you! Solar lights are super awesome! These are awesome Kati!! 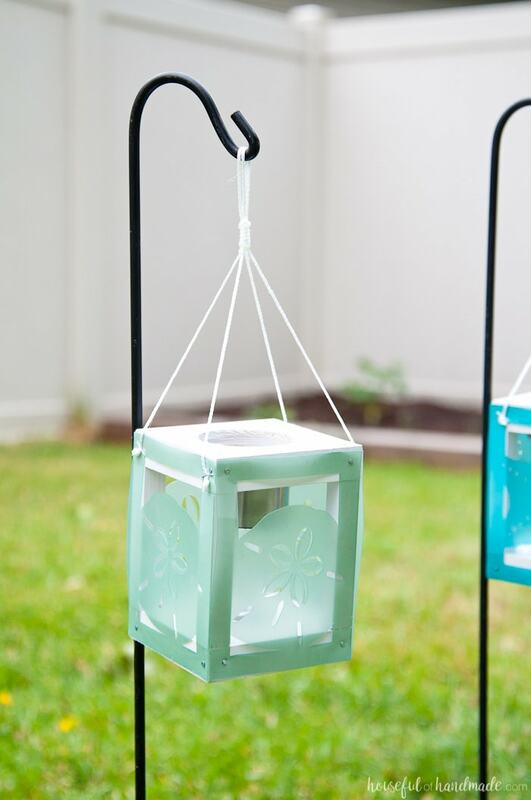 I never would’ve thought to make my own lanterns. I love how yours turned out, and how they can be customized with so many different designs! That is what I love the most, you can customize them however you want!